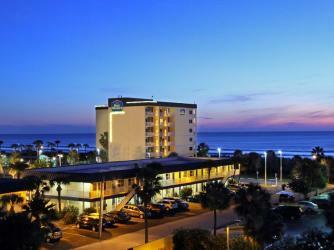 Located on world famous Cocoa Beach, The Best Western Cocoa Beach Hotel and Suites is a tropical themed hotel sitting on seven lush acres. And this beachside hotel utilizes every single inch of it with two outdoor heated swimming pools, a brand new fitness center, poolside veranda bar, shuffle board courts, business center, barbecue grills and picnic tables, and two restaurants. In addition to stellar property amenities, guests receive a FREE deluxe continental breakfast every morning and a Manager's reception from 6pm to 7pm every Tuesday, Wednesday and Thursday nights. Every guest room features refrigerator, microwave, coffee maker, hairdryer, free high-speed internet, free local phone calls, cable TV with free HBO, pay-per-view movies and video games. Pets welcome with paid fee.